Dealing with the many forms of this popular spa sanitizer. Managing the Chlorine level, of Spa, Swim-Spa or Hot Tub water!!! How to use chlorine, as a spa sanitizer? Chlorine is used as a spa or hot tub sanitizer, typically in the form of granular sodium dichlor. The other forms of chlorine, popular in pools, are not used in spas and hot tubs for a variety of seasons: solubility, build-up considerations and effect on the pH. Chlorine can used in another entirely different and better way: a salt chlorine generator uses ordinary salt and converts it into chlorine. This eliminates the need to handle, store or measure chlorine products. Chlorine can used as a backup sanitizer or oxidizer, in conjunction with Ozonation, Mineral Sanitizers, UV Sanitizing or Ionization. If problems arise, refer to the Spa Problems Page, as a source of problem-solving information, broken down into various categories. Scroll down the page and click on the linked keywords, catch phrases or images, in the archived answers below, to access additional information, on that topic or product. ► Chlorine Reading Gets Too High? Hi. I've switched to a floating dispenser and 20g chlorine tablets in our spa recently but notice that within 2 days the chlorine reading is way over 10ppm - even with the opening set to its lowest setting. So I end up taking the dispenser out for a couple of days - day which can't be right. The tablets say they are ok for spa, but Is there a specific type of tablet I should be using? Thanks. You're looking for something to add, that will last several days to a week. Chlorine tablets are simply to quick to dissolve, at the temperature of a spa, which is why you end up with high chlorine readings. Not a good spa sanitizer choice - it's better suited for pool use. Bromine tablets are much slower to dissolve and are better suited, for spa use. 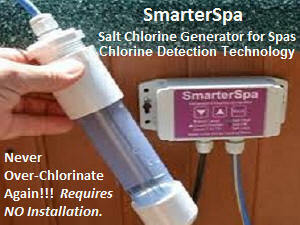 Even better is a salt chlorine generator, that is smart enough to only produce chlorine, when it is actually needed. You'll never over-chlorinate again, with a SmarterSpa Salt Chlorine Generator. It requires no installation and works independently of the pump. It is Plug-n-Play ready, providing better control and results. It eliminates storage, handling and measuring of chlorine products. I hope that this information will be helpful. ► I Can Smell Chlorine, But The Test Is Zero? My husband has added a lot of chlorine to our hot tub. I am able to smell the chlorine in the water. However, when the water is tested using test strips the reading is no chlorine (FCl). There is no color change at all. All the other parameters: TA, pH, CH are in spec. He has added chlorine several times with no change to the chlorine levels. Do you have any ideas what the issue may be? Your really can't smell chlorine in a spa. The active, germicidal form is measured as Free Chlorine and can't be detected below 300 PPM, by smell. What you cam smell and associate with chlorine is combined chlorine. It shows up on the total chlorine test, along with the free chlorine. The difference between the two readings is combined chlorine and that can be smelled, down to 0.1 PPM. It is odorous, irritating and ineffective as a sanitizer. This may sound counter-intuitive, but in order to destroy the combined chlorine, you have to add free chlorine. For each 1 PPM of combined chlorine, you need to add 10 PPM of Free chlorine. Start adding multiple doses every hour, until you get a free chlorine level in the 1-3 PPM range. The ideal range for combined chlorine is 0.3 PPM maximum. Than means the Total Chlorine reading should not read more than 0.3 PPM, higher than the Free Chlorine level. Adding a Floating Solar UV Sanitizer will work in concert with chlorine and allow you to cut usage, by 50% or more. It activates, with exposure to ambient or sunlight, and stays charged for days, with just normal usage exposures. Step one, would be to add enough chlorine to get a stable 1-3 PPM and then allow the Solar UV Sanitizer help you towards reducing chlorine consumption and additions. You should use a tester, that measures both Free and Total chlorine, for best results. A ColorQ Tester, which is all-digital and eliminates all color-matching, would be an ideal choice. As long as you are using chlorine, why not use it in a better and more controllable manner? A salt chlorine generator is the better way to do chlorine. Our website offers several, affordably-priced models and many require no installation. I hope that the information provided was helpful. Best wishes for the New Year. ► How Much Dichlor To Add? Hi Alan. I have a 342 gallon hot tub. Where is a good place to start as far as how much Dichlor to use in this amount of water to get it into the range where it should be? Thanks. How much you will need will depend on the content and quality of the water. Start by using the dosage recommended on the label. Give it a few hours and retest. Add more and repeat, as necessary, until you get a free chlorine level in the 1-3 PPM. Thereafter, add enough to keep it in that range. Adding some after each spa use will help. Test before using the spa and add, as needed. Every spa is different, so there is no set amount to add. A salt chlorine generator is an easier way to use chlorine. It eliminates the handling, measuring and storing of chlorine products and provides better control, over the chlorine level. Choose from several very affordable, no-installation required models. I hope that this recommendation works out for you. ► Salt Chlorine Generators With Chlorine Detection Technology? I have a tub and a swim spa. 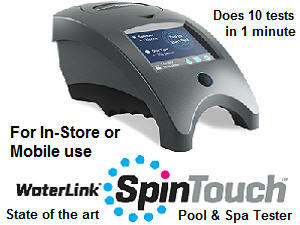 Have you tested these new units and can you confirm that they work well, in setting and controlling the Chlorine level? In both cases you are dealing with small volumes of water, as compared to typical pools. A hundred grams has a big impact on a spa or swim spa, but little in a typical pool. Two people in a spa is more like a hundred people in a pool, in terms of the waste being added, per volume of water. That's why spas and swim-spas have chlorine levels that deplete quickly, during use. The SmarterSpa has been sold for more that a year and I have heard no complaints. It used have a slightly different namw, but they changed the name to make it spa specific. Without the chlorine detection technology, it is the same as the ChlorMaker unit, which is controlled by power settings and timer. SmarterSpa turns itself on and off, according to the actual chlorine content, using chlorine detection technology, so you'll never over-chlorinate again. The MegaChlor units have a larger output, as they have 4 larger sets of plates, instead of 3 smaller ones, compared to ChlorMaker or SmarterSpa. That allows it to treat larger units, even pools. 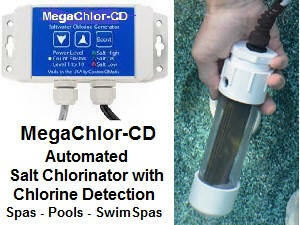 The MegaChlor and MegaChlor CD are identical, except that the CD model has chlorine detection technology. The inclusion of chlorine detection technology is reflected in the higher price. The CD version operates independently of the pool or spa pump and turns itself on and off, based on actual chlorine content. I hope that this will be helpful. ► Heavy Handed With Chlorine? My husband and I just got a new hot tub. We are not very educated in balancing the chemicals. We were told to use Chlorinating Granules, and then later add Stabilizer/Conditioner after the chlorine level was satisfactory. Are these the only two products we will need to use? Are there products that are more highly recommended? Also, my husband misread the directions and added way too much chlorinating granules (about 5 Tablespoons instead of a teaspoon!). Is there a way to reestablish the balance in the water, or do we need to drain the hot tub and start all over? Thank you. In addition to maintaining the sanitizer level, it is important to maintain the pH in the proper range. To help facilitate this, it is im portant to maintain the total alkalinity as well. There may be other issues such as calcium hardness and heavy metals: usually a water analysis is used to determine any appropriate treatment. Unless your hot tub is left uncovered and in the Sun, there is no need to add chlorine stabilizer. The covering of the hot tub eliminates any such need. If your hot tub has been overdosed, there is a chemical (Chlorine Neutralizer) that can be added to quickly lower the chlorine level. A level of 1.5-3 PPM of Free Chlorine is recommended. Partial replacement of the water, especially in a freshly filled hot tub, is a wasteful means of control. Remember this! You can always add more - you can't take out! Granular Chlorine is a hot tub and spa popular sanitizer. However, bromine can be used with a feeder or floater and has less odor. Salt Chlorine Generators, Ozone Generators, Mineral Sanitizers and Ultraviolet Sanitizers are other sanitizing possibilities. Browse through the archives for more on these topics. I hope that I have been helpful Enjoy the hot tub. I just had my spa water tested. My cyanuric acid was over 300. The people I bought the spa from gave me chlorine granules. I notice now that they have stabilizer in them. Is this a common chemical to use in my spa? I drained the spa to get rid of the cyanuric acid. What is your opinion and what chlorine should I use and how much and how often. My water was getting cloudy when it was covered but would clear up when it was shocked and left open for the sun to hit. Please help me my wife and I are new to this spa thing. We have no problem with our pool. Stabilizer serves no real purpose in a spa that is covered most of the time. The granular chlorine is a stabilized product and is the most common type used in spas: not because it is stabilized, but because it is completely soluble and essentially pH neutral. High levels of cyanuric acid should be avoided because it can reduce chlorine effectiveness. If you are going to use chlorine, follow the directions on the package. Add enough product to maintain a Free Chlorine level of 1.5-3 PPM. Adding some after each use of the spa, will help decompose bather wastes. Shocking weekly will help maintain water quality and avoid the formation of resistant organisms. Shocking the pool cleared the water up, by re-establishing the chlorine level and destroying contamination. Exposure to the Sun was just coincidental. When chlorine stabilizer levels are above 150 PPM, it reduces chlorine's effectiveness, forcing you to maintain a higher level. Spa water should be replaced every three months and that will lower the cyanuric acid level to zero. There are other means of spa sanitizing that you might want to consider: bromine, salt chlorine generators, ozone generators, UV sanitizers and mineral sanitizers. I hope that I have been helpful. Hi Alan, I have an eight hundred gallon hot tub. Recently, I could not find any SPA chlorine, so I bought chlorine powder for a pool. It does not dissolve in my hot tub! WHY? The only type of Granular Chlorine that is recommend for use in a spa is sodium dichlor. This product is completely soluble and is essentially pH neutral. These properties make it ideal for use as a spa chlorine. Other types are either too high in terms of the pH, are not completely soluble or are too slow to dissolve. You didn't supply the label information, so there is no way for me to be more specific. A guess would be that you bought calcium hypochlorite: a chlorine that is not completely soluble and is not recommended for spas. You might want to browse through the archives: there is information on other types of sanitizers that you might find more to your liking. If you want to stay with chlorine, a salt chlorine generator is the better way to do chlorine. I hope that I have helped clear up the mystery. ► Trouble Viewing The Colors? I seem to have a problem determining the best match on a spa water tester. Is there an easier way? Lots of people have color matching problems and sometimes it is due to color blindness. The ColorQ PRO 7 Water Analyzer can easily solve your problem. It performs 7 different tests: pH, free and total chlorine, bromine, total alkalinity, cyanuric acid and calcium hardness. These are all of the common spa tests and the ColorQ is all digital. No colors to match and no charts to look up. Is very simple to used and is very affordable. It will build your confidence and keep you in control. You did not mention how the spa is being sanitizer. There are other ColorQ models and I am sure that one will be perfect for your needs. I hope that I have been helpful. Alan, tonight is (unfortunately) the first time I've looked at your website. Until today, I've relied on the hot tub sales-guy to answer my questions about chemicals. Here's where I'm at. I have a (600 gallon) hot tub. I've used dichlor as a sanitizer since I bought it last summer. I was leaving for a 9 day vacation a couple weeks ago so called the hot tub sales guy and asked him what to do about chemicals while I'm gone. He said to come in and get some bromine tablets and drop one in the little basket thing before leaving town. I said, "But I've heard that you can't just switch from bromine to chlorine and back again." He said, "Nah. You can switch back and forth without any problems. It's no big problem. Look at the ingredients in the bromine products. They're all 80% chlorine anyway. Don't worry about it." So I bought bromine tablets (from him), dropped one in the basket, and left town. When I came back (a couple days early because of sickness), I checked the tablet, saw that there was still a little bit in the basket, so I pulled it out. Then I did my normal non-chlorine shock and thought I was good to go with my normal dichlor routine. When I checked the tub for chlorine this afternoon, the strip came up white (when it should have some purple color in it). I added a couple cap-fulls of dichlor (an amount that would have normally -- before the bromine tablets - brought it up to an appropriate chlorine level [1-5 to 2 ppm), and called it good. I went out an hour or two later, used another test strip, and it came up white. I tossed in a couple more cap-fulls of dichlor, and tested it again. White. You see where I'm going. So I called the sales guy and asked him if maybe these test strips don't work in the cold (I'm in North Dakota; today's high was something like -3°F. He said they should work fine in the cold but that maybe I had gotten water in the container and that I should buy a new bottle of test strips. I did (from him). I came back home, tested it again, nothing. Added more dichlor. Tested again. You see where I'm going. At this point, I've probably thrown in 4 or 5 times more chlorine than it would normally require to bring from 0 to 1.5 or 2. Then I came inside and did what I should have done first; some online research. I see on your site and a couple others that you can't switch back and forth from chlorine to bromine and back. Based on my limited knowledge in the area, I am guessing what's happening is that all the chlorine I'm dumping in is converting to bromine. That's why the test-strips never show any chlorine. (Right?) So. Enough with the problem. Let's talk about solutions. Keeping in mind that the high temperatures here are supposed to be below zero for the next week or so, and I want to use the tub again, what should I do. Draining it would do little more than create a regulation sized hockey rink in my back yard. That seems unworkable. I am guessing the tub has a huge amount of bromine in it right now. What can I do to get the bromine levels under control and get the tub useable (or is it useable right now)? I'm assuming the best course of action is for me to just switch to bromine until spring (and maybe longer, if I've figured bromine out by then). What would you do? Any suggestions you have would be appreciated. Thanks. P.S. Sorry I got so long winded. You may be long winded, but you aren't close to the longest letter. You have some misinformation that needs to be addressed. Yes, if you have bromides present from bromine tablet use or from the addition of sodium bromide, chlorine will convert to bromine. No, you can't have a large amount of bromine present, if all you added were a few bromine tablets. The amount of bromine is commensurate with the amount of bromides present: converted to bromine by chlorine or non-chlorine shock. You can convert from chlorine to bromine at will. To completely convert to chlorine, after having used the product for a while, you must replace the water. Here's what doesn't make sense. The test methods for chlorine and bromine are the same: only the color comparison charts are different. If you really had bromine present, it would register on the chlorine test. There are several possibilities: your chlorine level could actually be low, the test strips may be bad or the test strips do not work properly in the presence of high levels of chlorine or bromine. Inasmuch as I don't know the specific of your test strips, I can't speculate as to their suitability at high levels of chlorine or bromine. Test strips, such as Insta-Test Strips utilize a chemical called Syringaldazine, which is the best one to use in the presence of high levels of chlorine or bromine. You need to verify the test results with another product and/or test method. The limited use of the bromine tablets is not a part of this problem. It is far more likely that your spa has a high biological demand. Are the walls slimy? It could be possible that the problem was building over a few weeks, as a result of the sporadic and, possibly inadequate, addition of the dichlor. One way to avoid the ups and downs of sanitizer levels is to add an ozonator. This will allow you to reduce the amount of chemicals needed and help maintain proper sanitary conditions. I hope that I have been helpful. ► Traditional Chlorine Products Are Not Necessarily The Best Choice? Just tested out the ColorQ PRO 7, I have been fighting accuracy issues for some time now with test strips and trips to the local tub dealer. My most recent issue is with the delta being greater than 0.5 FCL just tested my 375 gallon hot tub at 102 degrees here are the results: FCL=2.88, TCL=7.32, pH=7.6, TA=108, CH=223, CYA=63. I'm not sure what to do to get the TCL down. I think that FCL is ok? Any suggestions? Thanks in advance. Chlorine would not be my choice as a spa sanitizer, unless it was in the form of a salt chlorine generator. At least, not as you a re using it. The difference between the total and free chlorine readings is combined chlorine: it can be odorous, irritating and ineffective as a sanitizer. To get the free chlorine and total chlorine reading closer, you will have to add about 40 PPM of free chlorine. Adding potassium monopersulfate is another solution, but I think there are better options. You could add a dose of sodium bromide solution (used in the bromine 2-part system) and continue with adding chlorine. The various forms of chlorine will convert the bromides into bromine. It will make the water smell better and simplify testing. You could also use bromine tablets in a feeder or floater. To further assure proper water quality, you could add a mineral sanitizer. This will allow you to get suitable results, while maintaining lower chlorine or bromine readings. Adding an ozone generator would further improve water quality, while greatly reducing the chemical presence. I hope that this information is helpful and thank your purchase of a ColorQ Water Analyzer. It definitely is a step up! ► Where Does the Spa Chlorine Go? The typical pool in your neighborhood has about 60 times more water than your spa. Add to this the fact that the spa is at a much higher temperature and this will produce more bather wastes. This means that the typical spa gets more demands put on its sanitizing system than the typical; pool. Sanitizer levels can be depleted very quickly and it just makes sense to test the water and add more chlorine before and after each use. However, if the spa is equipped with an ozonator or UV sanitizing unit, less chlorine will be used. Ozone and UV units have controllable effects on the sanitation, while chlorine effectiveness rises and falls with its concentration. A salt chlorine generator is a very affordable way to maintain a spa's chlorine level and eliminates many other chlorine issues: measuring, handling, storage and odor. These alternative means of sanitizing spa water are more flexible and provide a higher degree of effectiveness through use of a backup system. I hope that I cleared up the mystery. ► Favoring The Higher End? Hello Allan. I'm on your site often and find it to be most informative. We maintain an 812 gallon, in ground, indoor spa, which uses chlorine for sanitation. The information left by the professional pool company indicates the chlorine should be maintained at 3 ppm minimum. I thought I noticed you suggested 1-3 ppm for a spa, which is what they suggested for the 18,000 gallon pool and 783 gallon kiddie pool. Does 3 ppm minimum seem high to you, or is this necessary for proper sanitation? What would be the safe, high-end of that range - 5 ppm? It gets very, very, very little use. Thank you kindly. Having one or two people in an 18,000 gallon pool has little short term effect on the chlorine level, given the volume of water. Putting the same two people in an 800 gallon has a much greater effect, given the smaller volume and higher temperatures. For this reason, favoring the high end or slightly higher is preferred, so that sanitizer is present, when needed. A salt chlorine generator makes a for a better way to do chlorine, as it is controllable and eliminates the odorous forms, as well. I hope that this information is helpful. ► Tablets In A Spa? Trichlor tablets will dissolve too quickly at the temperature of a spa! I suggest that you use bromine tablets and keep the level at 3-5 PPM. Add a Mineral Sanitizer and you can keep the level at 1-3 PPM. Try running the ozonator for more hours a day. I suggest 4 periods of 2-hours. Make sure that it is working! Chlorine and bromine tablets are acidic and will tend to lower the pH. You can still use the dichlor as a shock. In hot water applications, bromine seems to perform better and is less odorous and irritating. Claiming a product will kill microorganisms requires and EPA registration. Unless your natural product has such a number, it may be wishful thinking. The ozonator will help you use less chlorine or bromine, in order to maintain this lower, but satisfactory level. Otherwise, you seem to doing things correctly and it may be just a matter of getting the bromine additions to better match your spa usage. You are not complaining about scale or hardness problems, so I will assume that The Magnetizer (shown on the right) is doing its thing! I hope that this information is helpful. ► Liquid Chlorine And Dichlor? I am treating a hot tub w/ about 300 gallons. Is there anything fundamentally problematic with liquid sodium hypochlorite 10% solution, aside from the pH, to for in hot tubs. I am interested in using it occasionally to add chlorine AND to raise the pH. I normally use dichlor but it slowly lowers the pH, even when buffered with Na bicarbonate and Na carbonate. I'm currently having trouble keeping the pH up to 7.5 with all the dichlor I use. I sometimes shock with dichlor too as I have a big bather load with kids etc. I'm very careful with testing and I think I can handle the balancing act with these two forms of chlorine, if there is no other issue with sodium hypochlorite. Thanks. The reason that liquid chlorine is not recommended is solely because of the high pH and the small volume of water in the typical spa. So long as you are aware of this and are judicious with the amount that you add, I see no reason that you can't use the product, as you have proposed! Testing the water for Free Chlorine and pH before and after each use of the spa, might be a good idea to assure that all of the Free Chlorine has not been depleted by the bathers and that the pH is within range. Using liquid chlorine by itself is not something that I would recommend. For sheer convenience and performance, a salt chlorine generator makes for a better way to do chlorine, as it is controllable and eliminates the odorous forms, as well. No more build-up problems. I hope that I have been helpful. Enjoy the spa. ► Trichlor In A Spa? I use trichlor tablets in my pool. Can I use them in a spa (completely separate from the pool)? Trichlor is not used in spas. It may be slow-dissolving in a pool, but the hot water of a spa will dissolve them much quicker. If you put the tablets in the skimmer, you will risk damage to the heater. Trichlor is very acidic and is not well suited for spa use. Bromine tablets, in a floating feeder, can provide the type of spa performance, that you associate with trichlor in the pool application. I hope that I have been helpful. ► Chlorine Tablets And Shock? What should I use for shock for an inground spa that is maintained with chlorine tablets? Trichlor tablets are not usually recommended for spa use. The high temperatures make them dissolve too quickly. They should never be added to the skimmer, as corrosion of the heater could result. As a shock, dichlor works well. Potassium monopersulfate is another popular choice. Bromine tablets are better suited for spa use. I would add a mineral sanitizer to reduce the bromine usage and chemical presence. Adding an Ozone Generator will cut the chlorine and shock usage dramatically and produce better water quality. 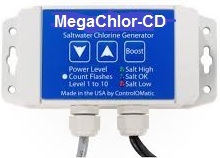 A salt chlorine generator is another, better way to add chlorine and it a better performing chlorine option. I hope that I have been helpful. ► Using An Inline Chlorine Feeder? We have a hot tub with a 2 speed motor. 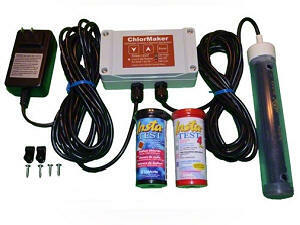 We find it difficult to use the chlorinator because of a too high chlorine reading. The chlorinator is an in-line type. When the 'jets' are turned on, the motor speed doubles, therefore doubling the amount of chlorinated water through the lines. We are currently just putting pucks in the skimmer basket and draining water then adding fresh water to dilute the too high reading. Any suggestions? This type of chlorine will dissolve too quickly at hot tub temperatures. It should not be used, in a residential hot tub or spa, for exactly the problems that you are encountering. This type of feeder is really meant for a pool. I suggest that you consider using a Mineral Sanitizer and maintain a free chlorine level at 1.5-3 PPM or bromine level of 3-5 PPM. Adding an ozonator will make it even easier and allow you to use less chlorine or bromine. If you want to stay with chlorine, a salt chlorine generator would be the better method. I hope that this information will prove helpful. ► Why Use Stabilized Chlorine? I am relatively new to the industry and I have a question that doesn't seem to make sense to me. Here goes! Why is stabilized chlorine seem to be the standard sanitizer for spas (when the customer wants to use chlorine). It seems to me that the amount of time a spa (residential) is exposed to the sun is minimal so it would make sense to me to not be adding all that cyanuric acid into the spa. Could you help me with this one. Thanks. A good question. It actually has nothing to do with the fact that it is stabilized. Sodium dichlor is completely soluble and close to neutral. Other granular materials, such as calcium hypochlorite and lithium hypochlorite, have a very high pH and that would require constant adjustment in a spa. In addition, calcium hypochlorite is not completely soluble. So if you want a completely soluble and pH neutral granule, dichlor is it! However, you probably will find a salt chlorine generator to be an even more convenient way to do chlorine, providing better results and no buildup problems. Welcome to the industry. ► Mixing Chlorine And Bromine? Alan, I was told not to ever mix Chlorine tablets and Bromine tablets in the spa, what are the possible reactions, if done so in a spa? You said there is a little Chlorine added to the Bromine tablets already. Yes, it is true that the bromine tablet do contain a chlorine product. However, when used as directed all of the chlorine will be converted to bromine. Chlorine tablets contain a different chlorine compound and are not recommended for spa use. These tablets are slow dissolving in a pool, but at the temperatures of a spa will dissolve too quickly. This quick dissolution could result in a adverse reaction with the bromine tablets and, in the interest of safety, it is never recommended that different chlorine and bromine products be mixed together in a feeder or other device. I hope that I have been of assistance. Enjoy the spa. ► Chlorine Converting To Bromine? I’ve read a lot of the material on your site and there’s one thing that keeps cropping up that I just don’t understand. You state that if there are bromine salts in the water when chlorine is added, that the chlorine will be “converted” to bromine. Could you explain this in detail? What is the process by which the chlorine is converted? Thanks in advance. When bromide ions are present and chlorine (hypochlorous acid) is added, the bromide ions convert to bromine (hypobromous acid) and the chlorine converts to chloride ions. This is a simple oxidation-reduction chemical reaction and not the literal physical conversion of chlorine to bromine, which would be a fusion reaction. I hope this explanation will suffice. We use liquid chlorine and acid in our inground pool. We have had no problems with the pool water and are able to maintain the water chemistry. Why can't we use the same chemicals in our spa? Thanks. While you did not provide the size of either the pool or spa, I am going to guess that the size of the pool is 12,000 gallons and the s pa is 275 gallons. This makes the pool 44 times larger, in terms of the water volume. This does not mean that you will only have to add 1/44th as much chlorine and acid. The higher temperature of spa water increases the amount of wastes being introduced into the water and this will require much more chlorine than that indicated, by a comparison of water volumes. Liquid chlorine has a very high pH and the acid a very low pH. It will be a difficult balancing act, trying to keep the pH in range. Keeping the chlorine level in range, can be even more difficult and you'll find that frequently there will be too much chlorine for bather comfort. It just makes more sense to use an appropriate sanitizer product, in a residential spa. The only chlorine recommended for use in a spa is sodium dichlor because this product is essentially neutral and, therefore, has little effect on the pH. There are other convenient means of spa sanitizing with chlorine, such as a salt chlorine generator. I hope that I have been helpful.